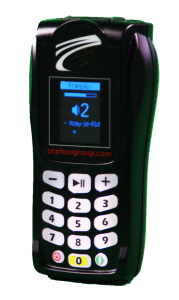 The Orpheo MIKRO enhances our diverse range of audio guide devices. You can enjoy its modern functionality without the sticker shock associated with similar products in the industry. Dedicated for traditional audio tours, the Orpheo MIKRO’s sophisticated design incorporates a display screen and standard size keyboard while providing the convenience of a compact size. It is a very light and handy device, comparable to a cell phone, capable of providing quality commentary for each point-of-interest in your site. AAC Mono / Stereo with 2 headphone jacks. High resolution colour screen [128×64]. ABS/Magnum plastic shock and fire-resistant. Theft protection system and automatic synchronisation system. Software to edit audio content (Optional).